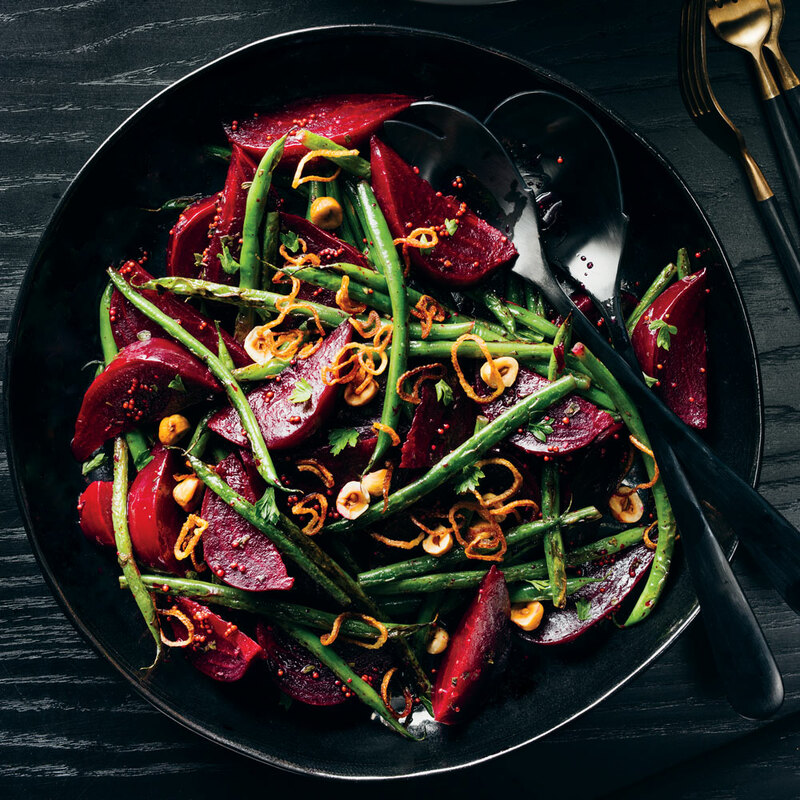 Kish pairs roasted beets and cast-iron-charred haricots verts with vinegar and hearty herbs (oregano and thyme) to make this salad. It is an homage to the jarred pickled beets and green bean salad she ate as a kid. Preheat oven to 350°F. Toss together beets, thyme sprigs, 3 tablespoons olive oil, 1/2 teaspoon salt, and 1/4 teaspoon pepper in a roasting pan or baking dish; cover tightly with aluminum foil. Bake in preheated oven until beets are tender, about 1 hour and 15 minutes. Remove foil, and let stand until cool enough to handle. Peel cooled beets, and cut into wedges. Discard thyme sprigs. Heat 1 tablespoon grapeseed oil in a large cast-iron skillet over high until smoking. Add half of the haricots verts in an even layer. Cook, without stirring, until charred on one side, about 2 minutes. Cook, stirring often, until tender-crisp, about 3 minutes. Transfer to a plate. Repeat process with 1 tablespoon grapeseed oil and remaining haricots verts. Sprinkle beans with 1/2 teaspoon salt and 1/4 teaspoon pepper. Toss together beets, haricots verts, vinegar, sugar, mustard, oregano, chopped thyme, and remaining 2 tablespoons olive oil. Season with remaining 1 1/2 teaspoons salt and remaining 1/2 teaspoon pepper. Cover and refrigerate at least 2 hours or up to 2 days. Stir together shallots and remaining 1/2 cup grapeseed oil in a small saucepan. Cook over medium-high, stirring occasionally, until golden brown and crisp, about 15 minutes. Using a slotted spoon, transfer fried shallots to paper towels to drain. Top salad with fried shallots; garnish with hazelnuts and parsley.